Despite it being a Saturday in half-term, there are hundreds of parents there all keen to share and be pro-active. Some have taken their children with them, as this festival of specialist learning was designed to be as inclusive as possible with various activities and quiet places on offer. This is about the SEND world (Special Educational Needs and Disabilities); this is a community which I'd probably never have known about if it wasn't for our daughter who was diagnosed with autism over eight years ago. These people are my 'tribe', some I've met in real life, others just conversed with online, but I know I have something in common with all of them. It makes for easier conversations when you know others just 'get it'. 'Everything I do, I do it for you' (great to get a Bryan Adams line in here - I went to see him in concert again this week. Definitely the highlight of my half-term) is a phrase which applies to both my girls. It's sadly probably true to say though that a disproportionate amount of my time and brain power is taken up with trying to make the world a better place for my autistic girl. Following through on that thought though, I have to believe that if it's better for her, it's better for our whole family. I suspect the others at FestABLE today would agree. This half-term has been a tricky one for a few reasons, some of which I alluded to in my previous post. Yesterday, I had a brilliant day out with our eldest daughter to try and re-balance that feeling of fairness and attention. 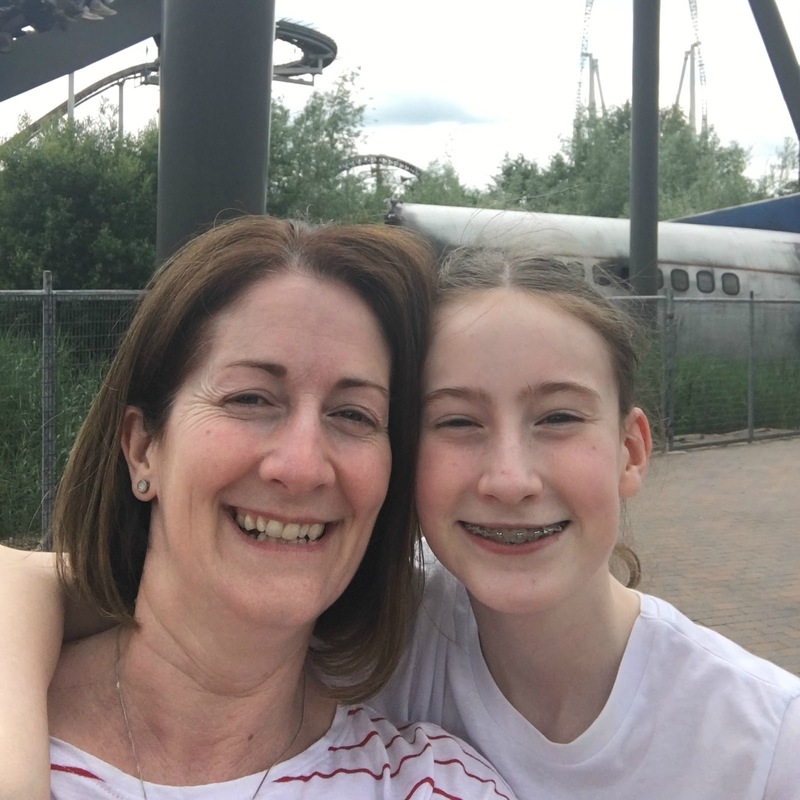 We went to Thorpe Park, and thoroughly enjoyed ourselves. Of course there was reflection about how it was not a place for Sasha and a slight tinge of sadness about how it wouldn't ever be a family day out for us. No bitterness; I can appreciate that there are many families who for various reasons are unable to enjoy a day out there. Sometimes it can feel as if there's always a price to pay for enjoyment though. Sasha wasn't pleased to be left at home with her Dad, even though she didn't want to come and could (kind of) appreciate that this was a treat for her older sister. She was happy to see me when we returned around 8pm, but instantly insisted that I would be spending the whole of the next day with her. She specified that meant ten hours of my time with her alone, to make it fair. Oh yes, that's right, she was talking about the day I was supposed to be spending at FestABLE, for her. But not with her, because for us it would be impossible to attend an event like that with Sasha. Unless alone at home, she is not able to be free and relaxed and to 'go with the flow' any more (if she ever was... somehow it seemed a little easier at times when she was younger). I almost titled this post 'the real reason why I'm not at FestABLE' but I've never been comfortable with 'intriguing' headlines. Last night I had to give my apologies for not being able to turn up today, and my reason was that I was feeling poorly after a possible dodgy burger at the theme park. This part is indeed true; our eldest was also up feeling unwell in the night, sigh. But at least half of my reason for not attending is, well, Sasha. It's got me thinking today, as I've watched and interacted with the #FestABLE tweets on Twitter, that even though this is a group of people who I know are understanding, I still found it difficult to give that full explanation. I knew that if I attended, the resulting meltdown from Sasha would have been painful to be around, but I held back from sharing that with those I was hoping to meet. There's always a part of me that believes others will think I'm overreacting, or 'giving in' to her, when I choose what will keep her calm over what I'd really like to be doing for myself. This is a huge part of life with Pathological Demand Avoidance. I've had to accept that it's all a balancing act, and I tell others that I've had to grow a thick skin and ignore any judgements. That doesn't mean I've stopped caring what others think though. Most can't understand what it's like, as parenting a child with PDA is so unbelievably different to so many other children. It sounds crazy to say that I couldn't go today; it's as if Sasha exerts some higher control over me. Well the truth is that she does, even though she doesn't realise it. I could have gone, but the aftermath would have been even more stressful than usual. I'm already wondering whether Sasha will be ready to return to school on Monday, after half-term is finished. I've been called a 'worrier' before now, which hurts but I realise this is what many probably think of me. That's not my natural state of being though, I wasn't a person full of anxiety before I had children. Keeping the balance at home is not easy; I'd love to be out and about and making choices about what I do for me and what we do for them... but my options are limited. I've learnt to live with that, and I'd say most of the time I'm happy and optimistic about it. Right now I'm living with the suspicion that my time to get things done is limited; if Sasha's current educational provision doesn't work out then we don't exactly have any options there either. Every once in a while it gets too much. That's why an event such as FestABLE is one to talk and write about. There are families making an effort to change this world for the better, and they should be applauded. Not everyone is able, even when willing. There needs to be those who talk and spread the word, and those who can follow through with actions. I'm hoping there will be more of both over the next few days, once everyone has recovered from the festival experience! Please do take a moment to visit the FestABLE website and see all that was on offer and being discussed. The more we share, the more 'mainstream' this talk becomes. * Knitting is something I've not done for years; Sasha recently picked up a ball of supersoft wool in Hobbycraft and has insisted that I make something cuddly for her. Other than the fact that I have a million other things to do, I feel she's being a bit hopeful about my craft skills!